This gives us another opportunity to discuss libertarianism and transhumanism. Consider: If he were to pursue radical life extension in strict accordance with libertarian principles, he would have to do so free from restrictions imposed by others and without in turn restricting the choices of others. This might be possible if he were a brilliant scientist living out in a solitary shack in the woods without contact with human civilization. 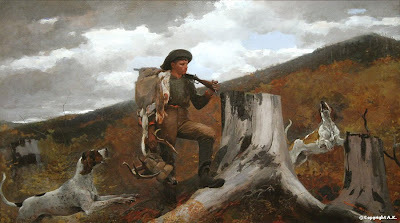 "A Hunstman and Dogs" by Winslow Homer. Courtesy WorldVisitGuide.But living alone in a shack isn’t usually conducive to major medical advances. The actual realization of our commenter Kurt9’s dream would require a society in which thousand-year lifespans were not just attainable but available to guys like him. That would be a society very different from our own. 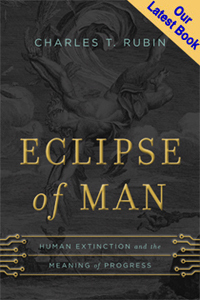 To put it simply, consider all the social, cultural, and economic changes that accompanied the doubling of human life expectancy over the last century and a half, and imagine the turmoil that would be involved in suddenly adding another nine centuries to the lifespan. The changes involved would be radical, complex, far from uniformly good or bad, and extremely difficult to predict beforehand. This actually hints at a deeper truth connected to how we think about the future. All human beings live in a particular time and place. Moreover, all our choices and our ways of life presuppose a particular society, culture, and set of institutions in which they can be realized. However much fun it might be for fiction or for a thought experiment, in real life it makes no sense to talk about how “the world as it is now” will be different from “the world as it is now with the single modification that one individual can choose to live for a thousand years.” It is a meaningless proposition, as much a practical absurdity as it would be for an ancient Roman to insist that it concerns no one else if he wants to invent and drive an automobile. This libertarian “freedom to do our own thing” implies that each individual should be equally free to pursue his or her chosen way of life no matter what that choice is, so long as no one else is harmed. Yet as much as you might not want to impose your own choices on others, it is an inescapable fact of life that our choices do impinge and often impose on others. Consider the old saw about liberty — that your freedom to swing your fist ends at the tip of my nose. But in real life, a guy flailing around with clenched fists is going to alter the behavior of everyone in sight. Or, to pick a different example, my neighbor’s choice to mine coal in his backyard obtrudes upon my freedom to choose to live in a quiet neighborhood with unpolluted groundwater and high property values. Or, to offer an example more relevant to some of our readers, your personal choice to develop an artificial intelligence that can write useful computer programs will impinge on my freedom to choose to enjoy a fulfilling and lucrative career as a computer programmer. Libertarian transhumanists don’t really seem to be interested in protecting each individual’s equal freedom to do and be what he wants. Rather, they are interested in defending their own prerogatives to pursue their particular choices to enhance themselves without any cumbrance or criticism. But even this narrower and more solipsistic version of libertarianism will ultimately have to contend with the fact that as any given individuals gain powers — particularly powers of the sort that would be available to hypothetical posthumans — they will gain also the ability to exercise those powers in spite of and over others individuals in ways that will be far more difficult to prevent, stop, or even detect. Liberty, rightly understood, does need to be defended. But we must also recognize that the image of liberty that some libertarians hold — epitomized by the iconic rugged frontiersman — depends on a self-reliance and self-constitution that are quite alien to today’s world. We are now more socially, politically, and technologically enmeshed than ever before. And while government tyranny remains a serious concern, there are other kinds of tyranny — including freely-chosen technological tyranny — that we should remain vigilant against. So what if there is turmoil brought on by radical life extension? So what? I don't consider the avoidance of such turmoil to worth the sacrifice of my life and freedom. This is the argument of a quiter. Winners never quit and quiters never win. You are quite right that the freedom to swing my fists stops at your nose. I agree with this. Personal life extension in no way represents an infringment on the rights of others. How does staying young and healthy into the indefinite future cause harm to others? I do agree if we all stay on Earth, the birthrate has to decline as more people become post-mortal. I am willing to accept this trade-off as I have no kids and have no intentions of having them. So, this is not a a problem for me. If you bother to look around you, birth rates are declining all over the world, East Asia, even much of the so-called "third world". I think post-mortality will push them down further. People who stay young and healthy will have little desire to have kids. So, the problem takes care of itself. I have no problem with a world full of "young-adult" post-mortal where there are no kids at all. In fact, this is essential the world I live in (SoCal, Tokyo, Bay Area, Shanghai) and am quite happy to live in such a world. In the long run, you know as well as I do that we will eventually get out into space. First the solar system, later the entire galaxy. There will be room enough for all, for every possible choice and endulgence. Infact, every one I know personally who is interested in radical life extension is also interested in space colonization (actually trasnhumanism came out of the L-5 Society). They also have no kids either. So, the only legitimate social argument against life extension, over-population, will resolve itself on its own. Your computer programmer argument is bogus. This argument is the one that says cars should have not been invented because they put all of the horse and buggy people out of work. Innovation always creates more jobs and opportunity than it destroys. Everyone know this. The idea that there is tyranny other than government is bogus. I do not know of a single example, either in history or today, where this has occured. Also, people like you who trot out this argument are the ones trying to force your beliefs and your choices down our throats. Not those of us who deny such arguments. So, it would appear that the only tyranny that we need to safeguard ourselves from are from people like yourself how trot out these kinds of arguments. I think your arguments against healthy life extension are quite silly. We WILL achieve radical life extension in this century, come hell or high water. As I said before, this is an existential issue for us. Failure is NOT an option here. As I also said before, I don't care about AI or uploading, because I regard these things as fantasies. I don't even care about restrictions on reprogenetics (designer baby stuff). You guys can ban this if you want. I have no dog in this fight. However, we do not compromise on the issue of radical life extension. We regard this as a personal matter and consider criticism of such to be way off base. Besides, so what if there are social problems? Our vastly extended life spans will give more than enough time to deal with whatever problems may crop up. One last point about libertarianism. I know you guys aren't into it. That's fine by me. I don't care. However, it is the philosophy that I chose to live by and the one that works best for me. So, unless you can sell me on a more attractive alternative, I will stick with libertarianism, thank you very much. Click on the link: "Demographic consequences of defeating aging" under the SENS, Forth Conference title. This will prompt you to download a powerpoint on the demographics of curing aging. Curing aging will actually solve the aging population problems faced by the developed economies of Europe, North America, and East Asia (especially Japan). I consider the above presentation to be pessimistic because it assumes that most post-mortals will still have kids. I think this is highly unlikely for various reasons. This is a link to John McCarthy's website discussion on the real resource limits of the Earth. It is based heavily on Julian Simon's works from the 80's. The Earth can easily sustain 15 billion people at U.S. standard of living. I fail to see how radical life extension will create any new problems. P.S. I have actually been in the crowded theme park depicted in the photo on the second slide of the presentation. It is in Yokohama, Japan. kurt9, I have to say that I'm sympathetic to you about libertarianism being coherent, attractive, and much better than pretty much anything else out there. But among the commonly-used labels, I'm more of a communitarian than anything else; Michael Sandel at least deserves a hearing. You have an excellent point about the way that the most cosmopolitan cities in the world are in fact trending towards your ideal -- individuals pursuing what they see as their enlightened self-interest without the kind of ties to community that most humans through history have faced. I'm a young adult in that world too, and it definitely can be intoxicating. But I think you're making too sweeping of a generalization to move from this to claiming that "people who stay young and healthy will have little desire to have kids. So, the problem takes care of itself." Certainly, a good bit of the desire to become a parent has to do with the desire to vicariously re-live youth; and that desire would cease if one simply kept that youth. But one reason I very much hope to have a family (which is diametrically opposed to your objection) concerns the interplay between the unique perspective which each different person brings into the world, and the awesome responsibility which a parent has of *helping* that perspective grow from nothing until it becomes independent of the parent. This is something I have a hard time imagining AI pets replacing. More importantly and much more simply, I want to have a family simply because I can't imagine being myself and being happy without one, precisely because it is something that is in our biological nature. Without 'reprogenetics,' the human race as a whole is going to feel the same way, I believe. I see your point. However, I stand by my argument that I think a post-mortal society will result in a near zero birth rate. I have lived through out Asia and have seen where people stop having kids or have fewer kids as their incomes and life style freedoms increase. This is a pattern that is replicating itself in almost every region of the world. I know very few people who feel the inate "urge" to have kids such as you do. I believe most people have kids for three primary reasons. First, they fear growing old alone and think that the kids will be around to look after them. Two, American society (believe me, this pressure is much less in most Asian societies today) in general puts a lot of social pressure on people to have kids even if they do not want them. Thirdly, people have kids for vanity. They want the kids to do and become what the parents always wanted to be but were unable to do so for any number of reasons. There are people, like yourself, who feel the urge to have kids and who cannot imagine life without them. But I think the radical decline of birthrates all over the world is evidence that you are not as numerous as you might believe. In any case, the powerpoint I linked to is based on the assumption that most people will have kids at some point in their lives. It clearly debunks the overpopulation argument against radical life extension. I included a link to John McCarthy's site on sustainablity to show that that the highest population projects on the powerpoint are within the sustainability limits of Earth's resources. Look guys. We've been wrangling back and for these past few weeks. I know what you want. You want to see a convincing economic and social argument in favor of life extension. I get it, and I think its cool. Most concerns about radical life extension have been answered on the SENS website (it may have disappeared when the site was updated, I'll bug them to put them back up if this is the case). I have thought for a long time to write a book presenting the social and economic arguments in favor of radical life extension. It would be very much in the style of the kind of books you find in the "Current Affairs" section of the bookstore. However, I actually have a sales and technical consulting business that limits the time I have available to write such a book. Also, such a book would be rather demanding as I would want to do the research and statistics (birth rate trends, economic growth rate trends, etc.) in order to properly present my case. Writing such a book would certainly be good PR for us and might actually boost my consuting business. I think its fair to say that space colonization will be an option by 2100. We're basically on the same page about population and resources, I think. Definitely, birthrates in underdeveloped countries significantly drop with increasing wealth and education; and while I can't read the ppt (Mac user, didn't buy ppt), I agree that *if* we get a lot better at common-sense sustainable agriculture, manufacturing, and energy, Earth will be able to handle plenty more people than it currently does. I also agree that we should be working much harder than we are on exploring space! Just a question of getting priorities in order. As for *why* have kids, your first and third points are definitely true. The second surprised me, though - I'm no expert, but (for example) I was under the impression that China's one-child policy was extremely unpopular. And so while you're right, birthrates are declining, I expect them to level out at 2-3 kids per couple, not 0 or 1. Although I admit there's no predicting what would happen if centuries-long lifespans became available to pretty much everyone. Good luck on finding time for the book! Maybe start with a longish essay first? It seems like for a lot of the 'current affairs' stuff, people will write articles, get feedback, and then expand on them. I was reading a management text book of a class that my wife is taking. It discussed the notion of internal locus of control vs. external local of control. This is actually a concept that I have had in my head for a very long time and it was gratifying to see it show up in a management textbook. I believe this is the fundamental characteristic that defines humans. Some are of internal local of control, others are of external locus of control. Internal locus of control are those who are self-driven. Then do not need an external stimuli to create their own goals and to pursue them. Entrepreneurs and most techie types are internal locus of control. Most other people tend to be more of an external locus of control. They may actually need the external stimuli (and rule book) in deciding how to live their lives and to set goals for themselves. Memes such as libertarianism and transhumanism are very attractive to people of internal locus of control. These ideas resonate with every bone in our bodies. We are into this! Conversely, people of external locus of control are going to be much more interested in conventional communitarian concepts of religion or socialism. Transhumanism and libertarianism is not going to have much appeal to these people. I accept these facts. The key here, and why I think there is no need for conflict is that transhumanism and conventional religion target separate market niches, in terms of the target audience. We're not poaching much of your market and you're certainly not going to poach much of our market. So, both systems and communities exist in parallel to each other rather than as direct competitors. This is the reason why I see no conflict on the horizon between transhumanists and others. I think that transhumanism and libertarianism is appropriate for people with internal locus of control and more communitarian concepts are appropriate for those of external locus of control. We all differ in our wants and desires in life. I think its silly to presume that there is a one perfect system that is appropriate for everyone. A multiplicity of systems is clearly our future. Transhumanism is merely one of those many systems that will be available. About reproduction, the reason why the one-child policy in China is not popular is because most couples either want no kids or 2 kids, but not one kid. The reason is that they want both a boy and a girl. Also, the preference that Chinese have shown for wanting sons over daughters is starting to change. The people on the East coast actually prefer having daughters over sons. In places like Shanghai, many people choose to have no kids at all. The Shanghai city authorities are trying to get the one-child policy removed because they want to encourage people to have kids, period. Most of Asian and Europe is leveling out at around one kid per couple. In any case, if you look at the presentation that I linked to, you will clearly see that it uses your assumptions, not mine, in assuming future birthrates. So, even if you are correct, it certainly is not credible argument against life extension. kurt9, thanks again for your reply. I think the distinction between internal and external loci of control is helpful, so long as it's made with a number of caveats. For example, entrepreneurs clearly are self-driven in an important sense, and yet the drive to become an entrepreneur itself might be a result of external influences (say, affirming parents and a culture that celebrates individualism through self-expression). And one should to be careful to keep condescension out of describing the "need" for external guidelines about "how to live their lives" -- I don't think there's anything inherently bad about this, although it *can* definitely result in problems. That said, I fully agree with you about there being different "market niches" for different "target audiences." You rightly say "a multiplicity of systems is clearly our future," and I'd add that it's clearly our past and present as well! Hence with you, rather than conflict, I both hope for and intend to work for genuine dialogue between transhumanists and, well, 'classical humanists'. But all the same, I think there definitely are going to be tensions if not all-out conflict. For example, while you were right to emphasize that legal pressure is a lot stronger than social pressure, I still agree with the basic point Ari was making in the first 'myth of libertarian enhancement' post. Unless/until we *do* get to the point where we colonize space and so there's a planet for H+ and a planet for good ol' fashioned H, wherever there's cultural overlap there will be cultural pressures both ways, and it can be quite strong. (M.T. Anderson's novel "Feed" expresses this quite well, I think.) Hence the need for ongoing dialogue, rather than simply attempting to 'go our separate ways' -- if we're going to be in tension, we ought to be examining it, I think. Which is why I appreciate your responses on this blog. Finally, thanks for the explanation about China, that makes sense. Again, I should emphasize that I completely agree with you about pragmatic/resource issues not being a good reason to oppose radical life extension. I'm only concerned about the moral questions, such as the tyranny one recently raised. Until we get out into space, there will certainly be political tension between life extenders and traditionalists. I envision a "red/green" (green meaning pro-personal biotech) divide in this and other countries analogous to the current red/blue political divide we have today. Its quite likely that the cosmopolitan cities and more liberal parts of the country will be the domain of post-mortals and the more rural, conservative parts of the country the domain of those who choose traditional life-spans. It all depends on how popular radical life extension is once available. This kind of bifurcation certainly does not phase me (having lived in Asia for 10 years, among other things, nothing phases me these days) as I am psychologically quite robust. These kinds of considerations certainly do not deter me from pursuing life extension for myself. One other thing. Once we get radical life extension. Those of us choosing it will want to opt out of the current "old age" entitlement programs of social security and medicare. We don't pay into them and we don't draw any benefits from them. People who become post-mortal will no longer have any need for these programs.